B12 is a hot topic in nutrition, especially amongst vegetarians and vegans. As Live Blood Analysts we spend a lot of time looking at red blood cells through the microscope and one of the most common abnormalities that we see are related to issues with B12. Live blood analysts are able to view a drop of blood in its ‘live’ state, meaning it is unstained, has had no chemicals added to it and is fresh, not clotted. Live blood analysis (LBA) is used to assess the state of health of red blood cells, white blood cells, platelets and the contents of the plasma. B12 is vital for normal red blood cell production and a lack of it is obvious when looking at a blood sample. B12 deficiency, if present, will be apparent in the size and shape of the red blood cells and in extreme deficiency we will see certain abnormalities in some of the white blood cells too. 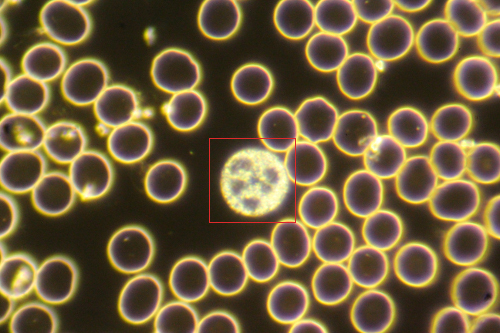 The picture below is of a blood sample, magnified 1000x through a darkfield microscope; the cell that has been highlighted is a ‘macrocyte’. A macrocyte is an abnormally large red blood cell and it is released into the blood stream when there is a lack of B12 (and folate, but more about that later). If there are a large proportion of these throughout the blood sample, it is a sign that there may be a B12 deficiency. Other cells that indicate issues with B12 are ovalocytes, microcytes and hypersegmented neutrophils. Correlations with diet – is there enough B12 available in the food the client eats? Correlations with digestive capacity – is the client suffering from digestive issues that can interfere with digestion and absorption of nutrients? Correlations with other issues found in the blood – is the blood showing a lack of iron? / is the plasma crowded with fibrin, indicating liver issues? / are there signs of leaky gut, indicating dysbiosis? / are the white blood cells out of range, indicating autoimmune issues? / is there a high level of oxidative stress or inflammation? Even consuming B12 in one’s diet or taking B12 supplements does not always ensure sufficient levels of available B12 for our body to use. How can this be? The answer lies in the complexities of the vitamin B12 itself and the complexities of the human organism. Vitamin B12 is the largest, most complicated of all the vitamins and it is also one of the most important nutrients for our health. In our body B12 is used as a co-enzyme that is involved in three vital processes that happen within every single cell of our body. It plays a vital role in the synthesis of DNA, the development of red blood cells and the creation of the myelin sheath that coats the nerve cells that allow the conduction of nervous signals. This is why the effects of a B12 deficiency can cause many profound and varied health issues. Folate is the name given to the naturally occurring vitamin B9, also known as folic acid when it is in its synthesised form. Both B12 and B9 are coenzymes involved in methylation reactions that allow for DNA synthesis. In a state of B12 deficiency folate (B9) becomes trapped as methylfolate and cannot be further involved in essential reactions for DNA replication. In this situation, if folic acid is given either as supplement or as a fortified food (such as cereals and bread products) the trapped folate is by-passed which temporarily masks the underlying B12 deficiency. The danger in this is that the damage from B12 deficiency continues and eventually symptoms of cognitive decline and anaemia occur. Therefore it is possible that, for those of us that are B12 deficient, it is dangerous to supplement with folic acid and it would be wise to be mindful of how many folic acid fortified foods are consumed. This makes it crucial for us to determine if we are or at risk of being B12 deficient. Homocysteine is produced in the body from the metabolism of an amino acid methionine which is ingested as a component of food protein. Homocysteine needs to be converted to S-adenosylmethionine (SAM) so that our body can create glutathione; the body’s most powerful anti-oxidant protecting our cells from free radical damage. If we are deficient in B12 and folate this conversion cannot take place, leaving high levels of homocysteine circulating in our bodies. This can lead to cardiovascular disease and cognitive decline. Making sure we have good levels of available B12 can protect us from the damage homocysteine can do. Consumption of alcohol, recreational drugs, toxins, chemical pollutants, or heavy metals can use up stores of B12 and affect production of intrinsic factor and absorption in intestines. Aging – our ability to produce stomach acid and intrinsic factor diminishes as we age. Many symptoms of old age are due to a lack of B12. Prescription drugs such as contraception, hormones, diabetes medication, proton pump inhibitors, blood pressure medications, beta blockers, statins and many more block the absorption of B12. Any form of liver congestion, disease or stress limits B12 storage and metabolism. Testing for B12 deficiency is tricky. The main method for testing is a serum blood test. This assesses levels of B12 in a sample of blood and is the standard test for general medical practice. However it is an unreliable indicator of B12 availability because B12 has a usable and unusable form which a serum test cannot differentiate between. Serum tests results can show a high level of B12, but not whether cells can actually access it. The majority of plasma B12 (70 - 90%) is in the form of haptocorrin (HC) and the rest is in the form of transcobalamin (TC), which is the only form that can enter cells. A test for transcobalamin would be more useful in diagnosing B12 deficiency. Methylmalonic acid (MMA) is a by-product of amino acid metabolism and is produced when protein is digested. In cases of B12 deficiency, our bodies produce more MMA and it is excreted via the kidneys. High levels of MMA in the urine can be good indication of B12 deficiency. By directly observing a blood sample magnified 1000x you can assess it for specific cell pathologies that indicate a lack of B12 - specifically macrocytes, microcytes, ovalocytes and hypersegmented white blood cells. If a large percentage of the sample contains these types of cells it is a sure sign of B12 absorption issues. The benefit of this blood analysis is that it can also offer indications as to the root cause of a B12 deficiency. Can we get enough B12 from our diet? B12, also known as cobalamin, is produced in animals by their intestinal bacteria. The B12 is then stored in their liver, muscles, eggs and milk. Our digestive tract is designed to absorb this B12 by consuming these animal products. B12 is also produced by anaerobic bacteria present in soils and so can be found on the unwashed skin of plants that are grown in naturally maintained, healthy soils. There are different forms that B12 can take but there are only two that can actually be used directly by the body; methylcobalamin and adenosylcobalamin. 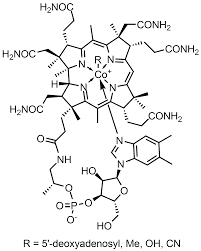 There are also two other forms, cyanocobalamin and hyroxocobalamin, that can be converted by our body into the useable forms. Then there are the analogues of B12 that have a similar structure but do not perform any of B12’s biochemical functions in our body. These analogues block the true B12 from being absorbed and so the more of these we consume, the harder it is for us to get enough true B12. Fresh algae produce true B12 but after drying it only contains the analogue B12. Additionally, the level of B12 available in plant sources can vary as levels depend more on the microorganisms in the environment than the plant. This is one reason why some research on Chlorella shows high levels of true B12 and in other studies it shows there is none. Most plant sources of B12 contain higher levels of analogue B12 than true B12, making them poor sources of B12. Choose a form of B12 that is most usable by the body – methylcobalamin or adenosylcobalamin. Avoid the cyanocobalamin form as it contains cyanide which, although is in very small amounts, still needs to be processed by the body. With all forms of supplemental B12 check the ingredients for sweeteners, fillers and other additives. It is always best to choose one that is pure or has as few ingredients as possible. Sublingual B12 can be in liquid or tablet formulation. It is deposited under the tongue and absorbed through the mucous membrane of the mouth. Although only 1 to 2% is absorbed this way, if any of the dosage is swallowed it can be absorbed through the digestive tract. Sublingual B12 is useful if the digestive tract is not in optimum health or if there is difficulty in swallowing. Transdermal B12 is a liquid B12 that is mixed with a carrier molecule that allows the B12 to pass through the skin. This is another useful method of delivery of B12 as it bypasses the digestion. About 6% of the B12 is absorbed this way, but it is important to make sure the skin is free from chemicals as these will get absorbed as well. Intramuscular B12 is an injection of a B12 liquid into the muscles where is it absorbed into the tissues. The advantages of this form of B12 are that it gets into the blood stream quickly and is therefore useful for those with severe deficiencies. It is also pure, containing very little other than B12 and 70% of it is absorbed, higher than any other form. Only a few injections are required to raise levels and stores of B12, and then a maintenance dose is required every 3 to 6 months, depending on the reasons for deficiency. Note that there are risks of bruising or blisters at the injection site, and also possible infections. Tablets or capsules of B12 that are swallowed are possibly the least likely to be absorbed as nearly all issues with B12 deficiency are related to digestive issues. 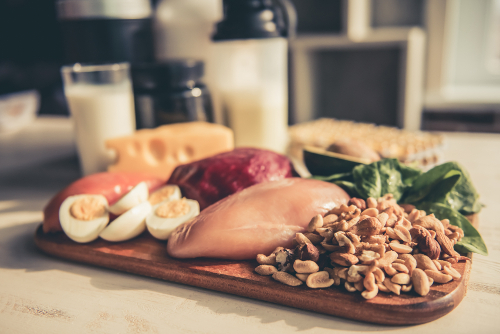 Vitamin B12 is essential to our health, yet in order for us to be able to absorb it we need to have a healthy functioning digestive system and the correct type of B12 in our diets. Live Blood Analysis can screen the blood for signs of B12 deficiency and it can also assess other issues that may be contributing to our inability to assimilate B12, such as digestion, absorption and detoxification. Uncovering the root cause of any B12 deficiency issue is the key to knowing what to do so the body can correct itself. The blood can then be reassessed by live blood analysis after a period of three months, by which time the blood cells will have been replaced. If changes to diet and a supplement plan have been implemented then there will be a clear difference in the condition of the blood cells – there will be less macrocytes, microcytes, ovalocytes or hypersegmented neutrophils and more normal healthy red and white blood cells. It has been a great year, and a big thanks go out to everyone who has taken part in a training course or one-to-one session over the last 12 months. We are very proud to be part of the growth of Live & Dry Blood Analysis both in the UK and around the world, and we really hope that LBA is a rewarding and lucrative part of your healthcare business. 2017 has been a transitional year for us - the Live Blood Analysis Training course is now run under the banner of the Naturecure Academy, and there are many exciting things happening behind the scenes in preparation for our big step up next year - the launch of our online LBA training course. The course will be a modular self-study course based on video tutorials, written content and real-life case studies, and will be perfect for students from anywhere in the world who can't make it to one of our classroom-based courses in London. Students will be able to study at their own pace whilst being fully supported by Naturecure Academy tutors. We will also be offering special deals for students to get hold of a darkfield microscope at an amazing price, and they will learn everything necessary ( both theoretical & practical ) to start practicing LBA. Watch this space! Anyway, have a fantastic Christmas and look out for our blog posts in 2018 with all the very latest news from the Naturecure Academy! We'd like to wish a warm welcome to all new visitors to our Live Blood Analysis Training website & featured blog. The Naturecure Academy is delighted to be offering an updated version of the highly respected Live & Dry Blood Analysis course run by Brina Eidelson of Inhealth for almost 10 years. Completely rewritten for 2018 and filled with the latest scientific research, the new LBA training course will enable you to add Live Blood Analysis to your range of client services. This fast-growing discipline gives you a fascinating window into the health of your clients, and we are confident will be an enormously rewarding new direction for your career. To support the various courses on offer, and to help spread the word about Live Blood Analysis, we will be posting all sorts of interesting content both here in our new blog and on our Facebook Page. To keep up to date with all this & more please join our mailing list and become part of the Naturecure Academy community of health practitioners.